This week’s article is the first to describe a high rank monster. It’s the Dah’ren Mohran, 4 Ultimate’s Jhen! It fights pretty similarly, but does have some differences. Check it out! 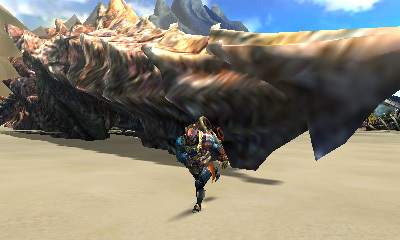 The Dah’ren Mohran quest acts as the gate to high rank online in Monster Hunter 4 Ultimate. 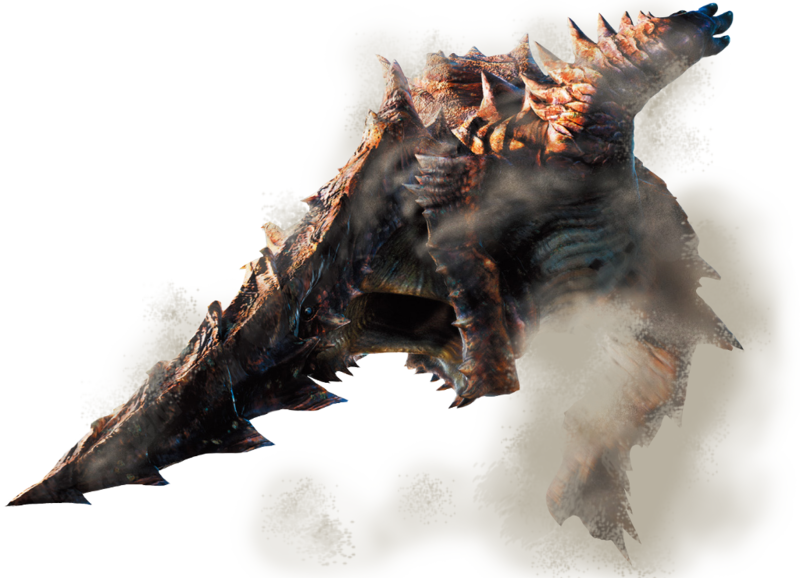 It’s a large, whale-like elder dragon that features reddish-brown skin and has a giant horn protruding from the end of its head. Its entire body is spiked; limbs, back, horn, everything, giving it a fearsome appearance. If you’re going in with an elemental weapon, pick thunder or dragon. 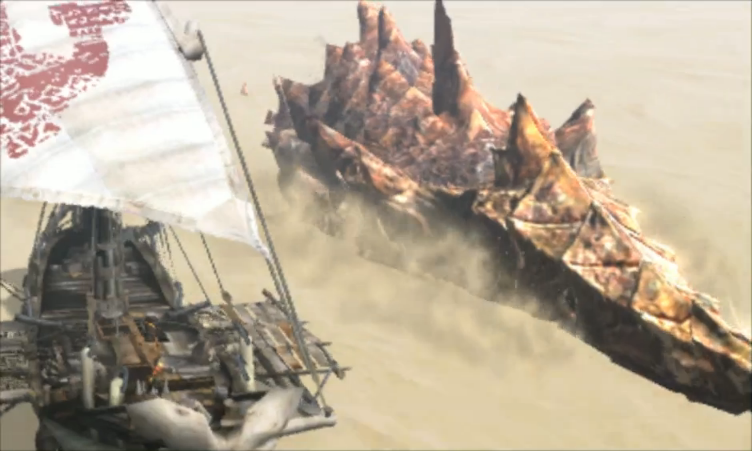 It’s first seen at the very beginning of the game, attacking your ship as you arrive at your very first town. The game teaches you to use the ship here, and makes you jump on its back to fetch your leader’s hat. The Dah’ren Mohran fight is pretty similar to the Jhen Mohran fight, but also contains a few differences. Like Jhen, it is fought from the back of a boat in the Great Desert, which can itself be damaged. If your ship’s integrity reaches zero it will break, and you will fail the quest. You can fire ballistae at Dah’ren, subdue it with the ballista binder and hit it with the dragonator. Those familiar with Jhen will find a lot of this fight quite similar, but will also note a few differences. The fight starts with the boat sailing across the sand sea in the Great Desert. Dah’ren will fire some rocks into the air, which after a few seconds will fall on to the ship to and cause damage if they fall on you. Dah’ren is also capable of causing giant spikes to embed themselves into the ship using the same method it does to fire rocks. These will always fall on to a ballista, a cannon or the gong, and can be broken by hitting it a few times. Otherwise, they’ll fall apart on their own after a while. Dah’ren, like Jhen, has a tendency to sway away from the ship and then ram into it, to damage both the hunters and the ship. When this happens, the ship will tilt and you’ll need to hold down the R button so your hunter can scramble back up and not fall off the ship. The Dah’ren will, twice in the fight, gently tilt your ship slightly off-balance so you don’t lose your footing and can jump on to its back. It took me a couple of hunts to realise this, as I kept mistaking this for a ramming attack, since the start-ups looks quite similar. While on Dah’ren’s back, you can mine using pick axes, so bring them! Dah’ren can be boarded on two separate sections. The back section contains one breakable part, and comes back every time the beast dives. As far as I can tell, it doesn’t give you a break reward, but does give you access to a weak spot and an excellent place for dropping dragon bombs. You can access the front of Dah’ren Mohran by jumping on to its arm when it gets close to the ship. The front section contains two breakable parts. One lies directly behind the front of the head, and behind that breakable part is a spike cannon, which is also breakable. The former will regenerate when Dah’ren jumps over the ship to the other side, where the latter will come back after a short time. There is another, safer way to get on to the front part, which I’ll discuss in a bit. It’s possible to jump on to Dah’ren’s horn at some points, though I’ve found this quite difficult, and it’s easier to get thrown off from there. It’s also a good place to drop your dragon bombs. 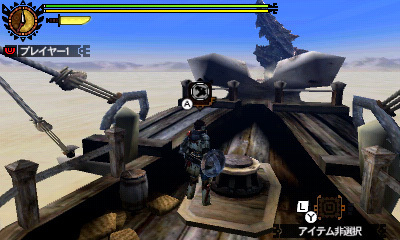 If you’re an insect glaive user and want to attack its breakable horn, you can leap over the barrier at the front of its head after climbing up its arm. Personally, I like to break its horn using ballista ammo. After you’ve been on Dah’ren’s back for a while, the monster will throw you off, which also does quite a bit of damage. When it’s about to do this, Dah’ren will suddenly stoop low to the ground and grow very still, as Jhen did. A difference here is that Dah’ren has a tendency to move away from the ship before growing still, meaning you can’t just jump back on to the ship and instead need to leap into the sand sea. Dah’ren has a new away of attacking the ship that Jhen lacked. It will start to pull away, and head towards the back of the ship and then off to the side, seemingly about to head below the waves. It will instead face the ship and ram into it with its horn for massive damage. This can be stopped with the gong or the ballsita binder. Should you fail to stop it, Dah’ren will then be in a position to sweep its horn from one side of the ship to the other, which can be quite difficult to dodge and devastating for the ship. After a time, Dah’ren will leap over the ship, moving from the starboard to the port side of the ship to resume its assault. Shortly after its leap, it will do its gentle nudge to slightly tip the ship, giving you your second chance to jump on to its back. Once it’s done on the port side, Dah’ren will begin an attack from the ship’s front. It will offload a bunch of rocks, and then start to dive towards the front of the ship. It will leap three times out of the sand, before landing an attack on the ship’s front. This can be stopped with the dragonator, which lies at the front of the ship, meaning that whoever uses the dragonator puts themself at risk. 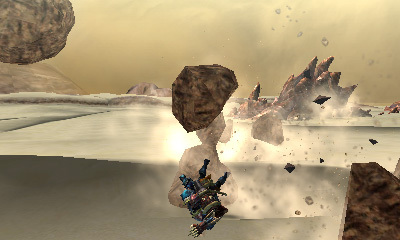 To land the hit correctly, hit the dragonator at the beginning of the second leap, just as it emerges from the sand. Doing it too early means the dragonator will miss, and too late means it will still hit, but you and the ship will still take damage. Sometime after the dragonator chance, you will enter the second stage of the fight, the “final showdown”. In the final showdown, the ship is no longer moving, and Dah’ren is on its feet. It starts out a way away from the ship, and will slowly make its way towards it. At first, it is in an area beyond an invisible wall; I’d recommend gathering some ballista ammo before running out to meet it. You can attack and break Dah’ren’s front arms from the ground; they can also be broken in the first stage of the fight using ballista ammo and can be attacked directly when it’s near the ship. When you break one of its arms, or even if you just hit it enough, Dah’ren will stagger and then lie down for a few seconds. While it’s like this, you’re able to clamber up its arms to make it to the front part of its body, which I find much easier than trying to jump on to it from the ship. In the final showdown, Dah’ren Mohran will attempt to harm both you and the ship using a wide sweeping attack; it will also attempt to body slam you. 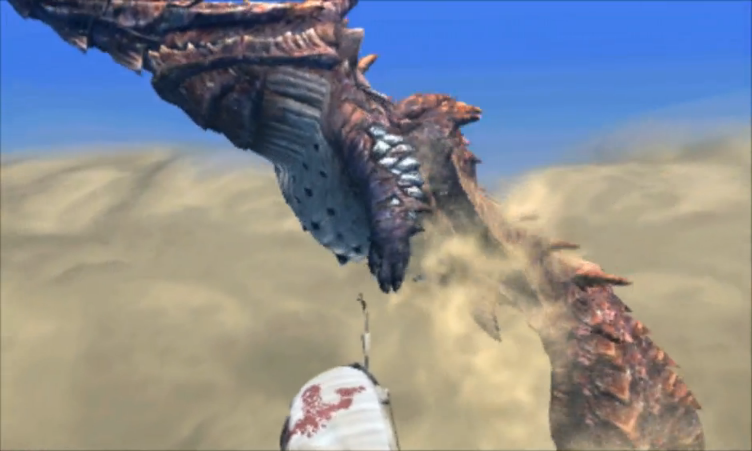 Dah’ren is capable of spitting out a powerful sand breath attack, as seen in G rank Jhen fights in 3 Ultimate. These can all be stopped using the ballista binder or the hunting gong. Dah’ren can also be stabbed with the dragonator if it gets close enough. Once its dead, like Jhen, you get eight carves; four from the body, and four from the head. That’s it for the Dah’ren Mohran. Next week I’ll take a look at the Basarios Subspecies, which I like to call Ruby Basarios!